Thank you toniandtawni.com for the image. 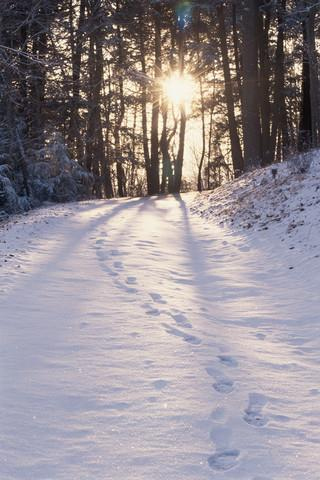 The footprints in the snow disappeared and along with them the last rays of sharp winter sun. Only soft giggles echoed across the frigid air. Lily pulled back her horse’s reins, and the gelding skidded to a halt. Where were they? Surely they couldn’t have dissolved into nothingness? Certain she had seen children ahead of her where the road made a sharp curve. Had the reflection of the sun on the snow played with her sight? The trail would be treacherous in the dark, and deadly for those on foot. Lily edged her skittish steed forward. The snow blanketed the branches of the giant pines as they rustled and bowed. Lily squinted as she looked closer, there was no breeze. The trees promptly tipped their mounds of iced powder to the ground. And left an untidy hump of snow in their path. An eerie sensation stirred the air around her, one she had never felt, but had heard of at many a fireside storytelling. It couldn’t be; they weren’t real. “A bloody myth!” She hissed under her breath. Goliath stomped his front hoof into the ground as if in agreement. There was no such thing as the Namma Namma people. They were a story told by the old to keep the young in line, weren’t they? Some people believed in Kelpies, others in Banshee. But up here in the mountains, they were terrified by tales of the pernicious Namma Namma people. A giggle like a thousand little bells resounded around her, trailing a chilled fingernail down her spine. It was cold out here in the woods, but their laughter prickled like iced fingers. A blue haze flashed past her peripheral vision. Goliath pranced unhappily on the spot. His long mane bounced like a sea of ebony silk on his thick, strong neck. “Whoa, boy, steady now,” she whispered to him. Her voice calmed the high-strung horse who, like her, sensed something was not right. It was time to leave; she must make it to her cabin before the sun faded leaving them both in the icy grip of the night. Goliath shook his head, pulled at the reins, and neighed loudly at his mistress. The giggling cracked the frosty air as it grew louder. “Heeya!” Lily shouted as her heels dug into Goliath’s flanks. But instead of bolting, the steed reared. The solid black wall of his neck bashed her face and broke her nose. Stars twinkled, and pain seared as she tumbled from her saddle. Her head hit a bare rock jutting from the snow. Her vision spun and faded, her limbs ignoring her plea to move, to get up! A tall indigo figure glided toward her. Long pale fingers stroked her cheek, and a musical voice whispered. Powerful images! I want to know more about about the African myths. I used to invoke the term triptychs when teaching about oral tradition of literature in library lessons. I will send you a personal Msg from gmail.